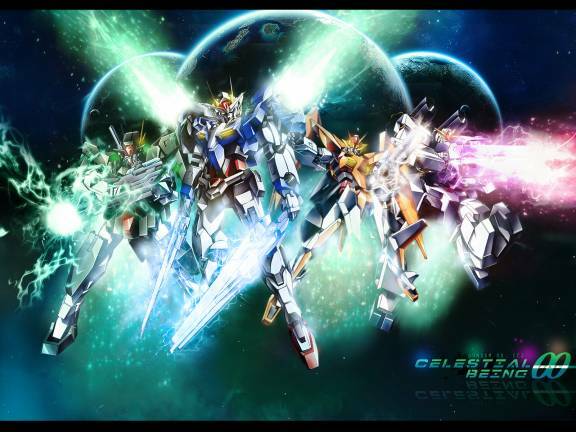 The upcoming Gundam 00 (Double-Oh, think James Bond) movie will probably be screened in Singapore on Sept. 18, 2010. While no venue has been announced yet, the Gundam Fiesta there is kind of hard to miss, so consider this an educated guess. In addition, the screening will be with English subtitles. Apparently, after years of a wide disconnect between Gundam in Japan and Gundam in the Americas (where nothing has really taken off since Wing), Gundam 00’s backers want this to be a true worldwide phenomenon. In previously announced news, the Gundam 00 movie will definitely be screened in New York on Oct. 10 at the New York Comic Con and the New York Anime Festival. Again, with English subtitles. If I can lob a criticism at the two TV seasons, it’s that the plot writing tended to be rigid because they “had to” produce a particular outcome, else this movie would not have been possible. Thus, there was some sense that things were stilted, that certain things were built to fail (in character and out-of-character), and well, let’s not get started on insurgent military tactics. It won’t end well. But, Gundam 00 is blameless for pure eye candy on parade, which it is. Whatever you think of the rest, the CG animation was top class for television. A movie version can only be expected to be that much more visually impressive. Any reporting on rumors and such here will be under spoiler tags in the future. Public news will be reported as-is. At present, we have to wonder where else English screenings will take place. This entry was posted in Anime, Japan, Movies and tagged anime, anime festival, Comic Con, Gundam, Gundam 00, Japan, movies, New York. Bookmark the permalink. 3 Responses to Gundam 00 Movie Screenings – With English Subtitles! I am fine good was see yeah are good I are today yeah are got were for we the are bye today.